Nowadays, the application of integrated wiring system is becoming more and more widespread. The patch panel is indispensable in the integrated wiring system. It has played a management role in the connection, distribution and adjustment of the cable, and can also reduce the fault. Since the patch panel is so important, do you know what is patch panel? Patch panels are socket groups that connect incoming and outgoing lines together in communication and electronic systems, so one end of the panel is plugged into incoming lines, while the other connects to outgoing lines using short patch cables. Also known as patch bays, patch fields or jack fields, patch panels are commonly used in radio and television. At present, patch panel comes in various types on the basis of different classification standards. Generally speaking, there are fiber optic patch panel and copper patch panel. According to the number of port: generally, it has been classified into 12-port patch panel, 24-port patch panel and 48-port patch panel, of which 24-port patch panel has been used frequently and widely. According to the classification of shielding layer: patch panel can be classified into the shielded patch panel and the unshielded patch panel, in which the unshielded patch panel has been used widely. According to the types of cables: the copper patch panel is generally classified into two kinds: Cat5e patch panel and Cat6 patch panel. The Cat5e patch panel is used to manage the components of the Cat5e network cable, while the Cat6 patch panel is used to manage the components of the Cat6 network cable. 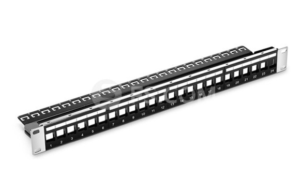 Besides, single mode patch panel and multimode patch panel are also available, which is used to interconnect single mode or multimode fiber patch cables. For example, there are OS2/OM3/OM4 LC or SC fiber patch panel used to connect LC/SC fiber cabling. There is no doubt that the patch panel is an indispensable part of the cabling systems, because it provides a simple, tidy and easy-to-manage solution. No matter how big or small your business infrastructure is, the patch panel is essential. So what are the benefits of the patch panel? All in all, the patch panels is indispensable in the enterprise or home network to organize cables. Just imagine that you’re putting together a home or business network, can you finish the job without patch panels? Besides, the advantages of patch panel is stretching across a wide range of constructions. With competitive price, FS.COM can provide high-quality patch panels mentioned above. Please contact us if you have interest. This entry was posted in Cable Management and tagged benefits of patch panel, patch panel, patch panel types, what is patch panel on July 27, 2018 by Admin.